When it is time to pick your new fireplace insert, pick the one that enhances your life, instead of creating more work. Your life is busy enough. Don't make a simple addition to your home a lifelong chore. This propane gas burner uses a clean gas and puts out much less pollution. Also, due to the lack of real wood, there will not be wood, ash and embers to clean up after. The hand painted logs include all the varying details of real logs. They are placed upon three burners inside crushed glass. The glass allows you to see the flame ignite and bounce around, creating the perfect glow, within the walls of your fireplace. 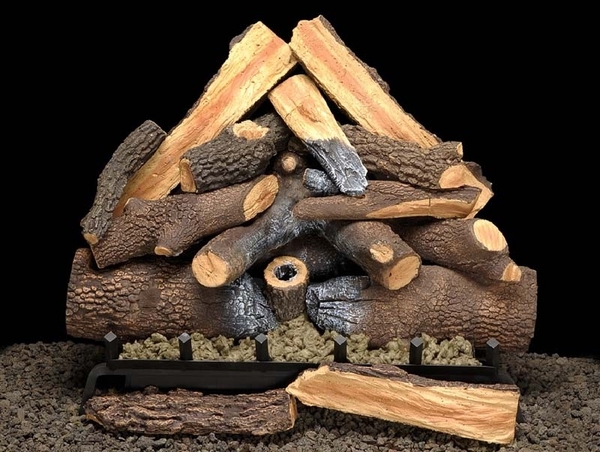 Please Note: The fireplace's Middle Width must be at least 42 Inches and the Depth must be at least 18 Inches for this gas log set to fit. You can calculate the middle width of your firebox by measuring the width (left to right) approximately half way back in the firebox. If you have any questions, please contact our customer service department and we will be happy to assist you in finding the perfect size gas log set.